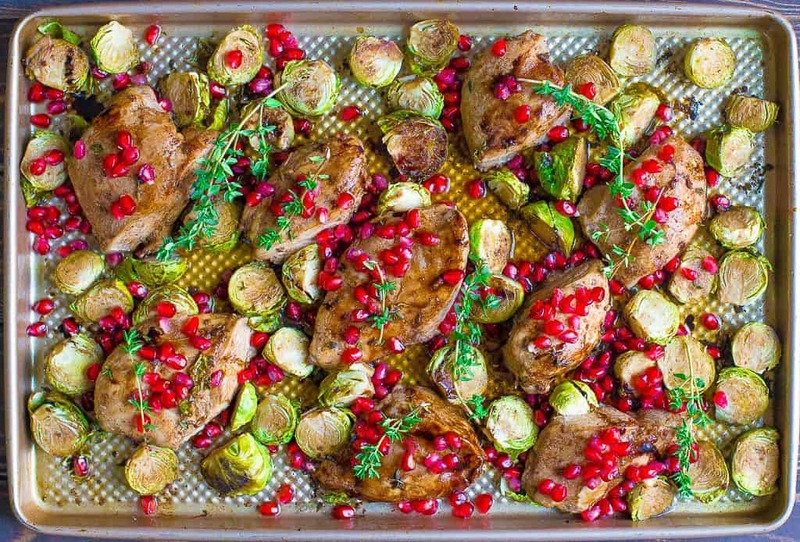 This easy sheet pan dinner has a delicious sticky pomegranate sauce, and is baked to perfection with tasty Brussels sprouts! 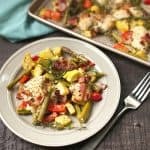 Easy for a weeknight dinner, and elegant enough to serve to guests! Paleo, and Gluten-Free. Because the sauce I came up with has pomegranate juice, honey, orange zest, and balsamic vinegar, it gave reminded me of our favorite way to bake Brussels sprouts: Honey Garlic Balsamic Brussels sprouts. 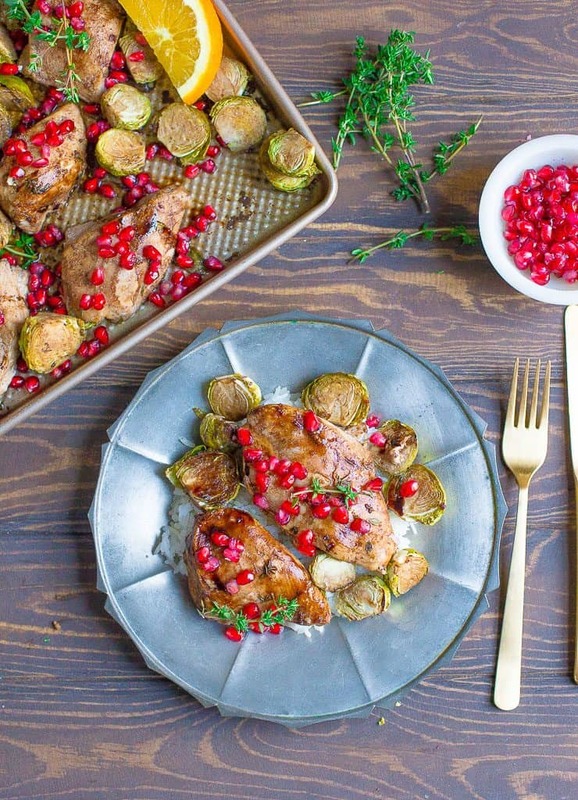 Brussels sprouts seemed like an easy companion with this sheet pan chicken. 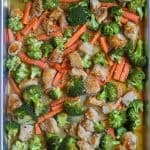 The best part, is they have the same requirements for cooking time, making this one pan dish easy peasy!! While your dish is baking, you can heat up the chicken marinade in a sauce pan to create a really delicious sticky sauce to go on top. Optional, but kind of necessary! As we approach the holidays, this dish seems like an easy fit for the Christmas season. The colors also remind me of my new favorite Christmas appetizer: Pomegranate Avocado Salsa. 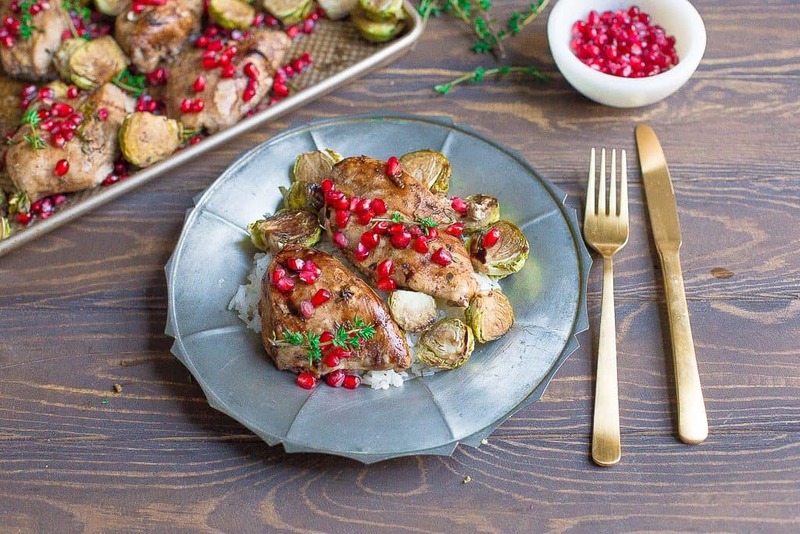 I am determined to have a complete pomegranate meal with all of my favorite pomegranate dishes in December! Who else wants in? Did I mention my Slow Cooker Cranberry Pomegranate Sauce? Another holiday favorite. Getting a little carried away here you guys, but hope you enjoy the dish!! Make sure your chicken breast are pounded to 1 inch thick. Set aside to a large bowl. Make the marinade: combine juice, vinegar, coconut aminos or soy sauce, honey, orange zest, garlic and oil. 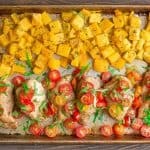 Pour on top of the chicken, and marinate for at least 20 minutes (up to 12 hours). Preheat your oven to 375. 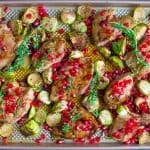 On a sheet pan, spread out Brussels sprouts and marinated chicken (reserving marinade). Brush Brussels sprouts with marinade. Season the entire dish with salt and pepper. Place inside the oven, and bake for 25-30 minutes (depending on chicken size and oven). While dish is baking, heat up the reserved marinade in a small sauce pan. Bring to a boil for 3-4 minutes until sauce reduces and thickens. Set aside to cool. 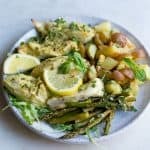 Remove chicken and Brussels sprouts from the oven. 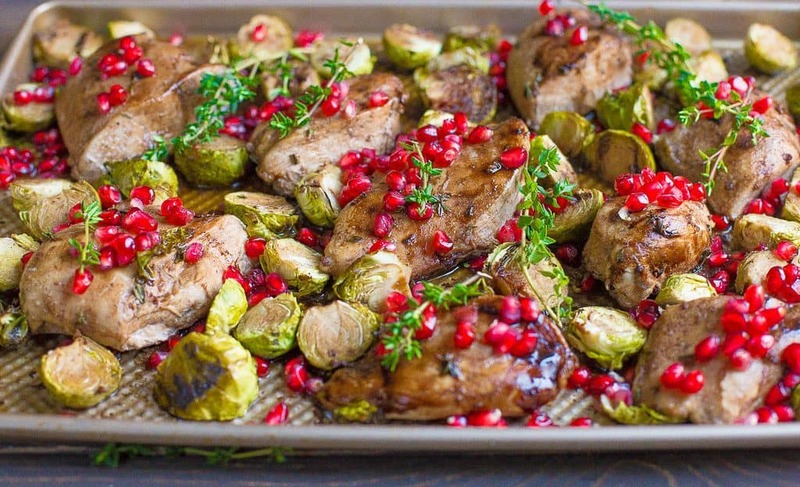 Brush additional glaze or sauce over the chicken and Brussels sprouts, and add pomegranate arils on top of dish. Serve plain, with rice, or with cauliflower rice. Top with fresh thyme (optional).